South Africa collapsed after lunch on day three in Durban to bring Sri Lanka back into the first Test as they chase 304 for victory. The Proteas looked to be in complete control at the end of the first session at Kingsmead, even after losing Quinton de Kock (55), with their lead standing at 271 runs. But the hosts added only 32 to that total after the restart as Sri Lanka took five wickets - including that of Faf du Plessis (90) - for just eight runs in a dominant spell, inspired by debutant Lasith Embuldeniya's 5-66. That flurry ensured a more attainable target for the tourists and they were still in the contest at stumps, with Kusal Perera (12 not out) and Oshada Fernando (28 no) battling away on 83-3, 221 short of an unlikely triumph. Bad light has stopped play in Durban. SL end the day on 83/3 after 28 overs. Fernando 28*, Perera 12*, they trail by 221. Already in a commanding position, South Africa cruised through the first session of day three as Du Plessis and De Kock built a partnership of 96. Kusal Mendis was substituted out for a time as a Du Plessis edge did not carry and he was hurt in stooping for the catch, before insult was added to injury when an overthrow provided De Kock with a 56-ball half-century. However, a rare De Kock error saw the Proteas star waste a review on a blatant lbw as he was trapped by Embuldeniya to halt the stand short of a century. It initially appeared to matter little, yet the match turned dramatically in the second session. Vernon Philander was the first to go as he was beaten by Embuldeniya, before Du Plessis followed via a straightforward lbw decision off Vishwa Fernando (4-71) just before a drinks break. South Africa's lower order never recovered and Embuldeniya swiftly added Kagiso Rabada, with Vishwa removing Keshav Maharaj and Dale Steyn to suddenly conclude the innings. Sri Lanka bowl South Africa out for 259. They need 304 to win! Keen to seize this improbable opportunity, Sri Lanka made a solid start with the bat as Dimuth Karunaratne and Lahiru Thirimanne paired for 42. 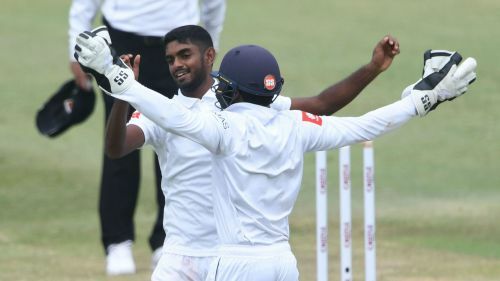 But the duo departed in quick succession with Rabada snaring Thirimanne while Karunaratne went to a tight lbw call, and then Mendis sent a cheap edge behind for a duck to hand Duanne Olivier a wicket. Bad light stopped play for the day as Sri Lanka steadied the ship through Perera and Oshada, with plenty of work left to do but the tourists at least in with a fighting chance.